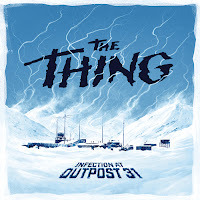 It is the start of the bleak, desolate Antarctic winter when a group of NSF researchers manning the claustrophobic, isolated U.S. Outpost 31 comes into contact with a hostile extraterrestrial life form. Bent on assimilating Earth's native species, this being infiltrates the facility — creating a perfect imitation of one of the Outpost 31 crew. The staff frantically begin a sweep of the base, desperate to purge this alien infection before escaping to warn McMurdo Station that somewhere, out there in the frigid darkness, something horrible is waiting. In the hidden identity game The Thing: Infection at Outpost 31, you will relive John Carpenter's sci-fi cult classic in a race to discover who among the team has been infected by this heinous life form. 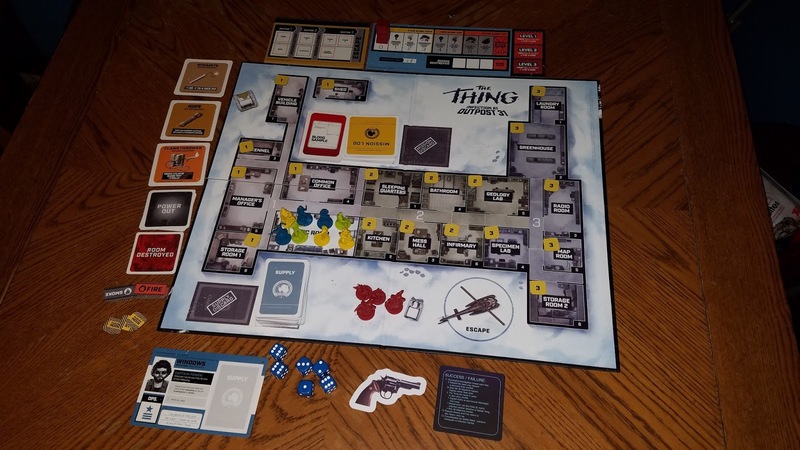 Play as one of twelve characters as you lead a series of investigations through the facility using supplies and equipment to clear the building. The tension mounts and paranoia ensues as you question who you can trust in the ultimate race to save humanity! 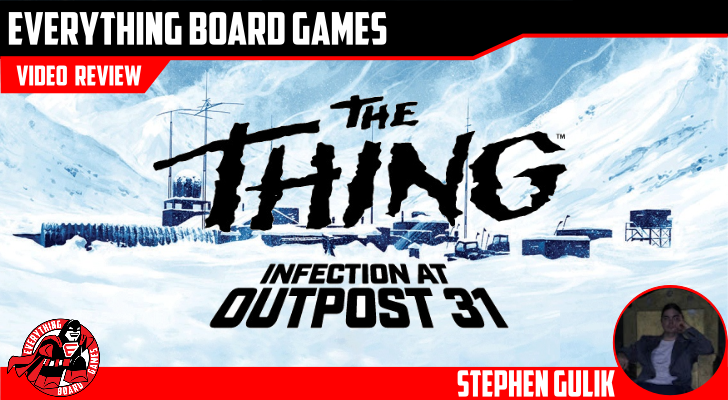 The Thing: Infection at Outpost 31 is a fun, highly interactive social deduction game based on the classic film. It's part roleplaying and part bluffng, with minimal luck and ingenious implementation of theme-driven mechanics that provide many subtle opportunities to figure out who the traitor is. But you can't be sure without a blood test. I was expecting this to be a bit like Dead of Winter. 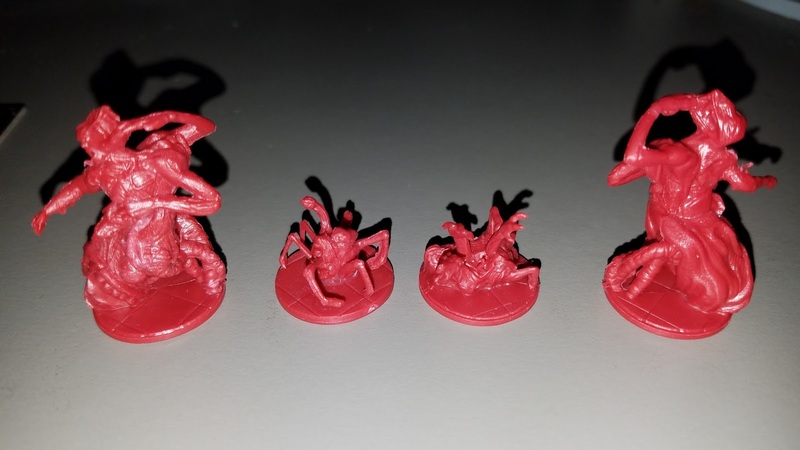 It's more like Werewolf, except fun (i.e. it has rules, a board, and mechanics). Werewolf always struck me more as a demonstration of mob psychology than a game. You may have guessed by now that I'm not a fan of Werewolf. I don't like party games, deduction, bluffing, or character elimination. The Thing has all of these, but I still enjoyed the crap out of it. That says a lot. Or maybe I've been replaced. I'd notice if that happened, right? This is about the only game I can think of that's great with eight players. 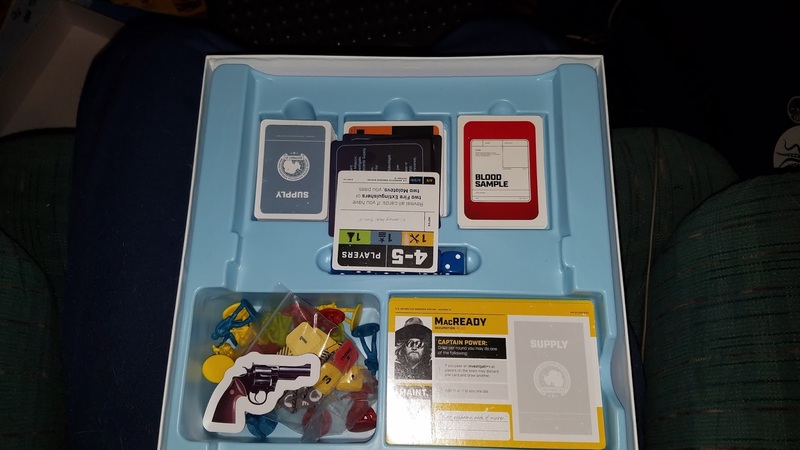 It perfectly straddles the line between party game and strategic board game. Possibly best of all, it's easy to explain to a large group of non-gamers, and plays just as well drunk or sober. Joe Van Wettering deserves a Nobel Prize. The rulebook is eighteen pages with lots of pictures and large text. Once you understand the premise and flow, you can teach it with the reference cards that provide step-by-step instructions. The book is laid out well, so it's easy to reference anything that needs clarification. 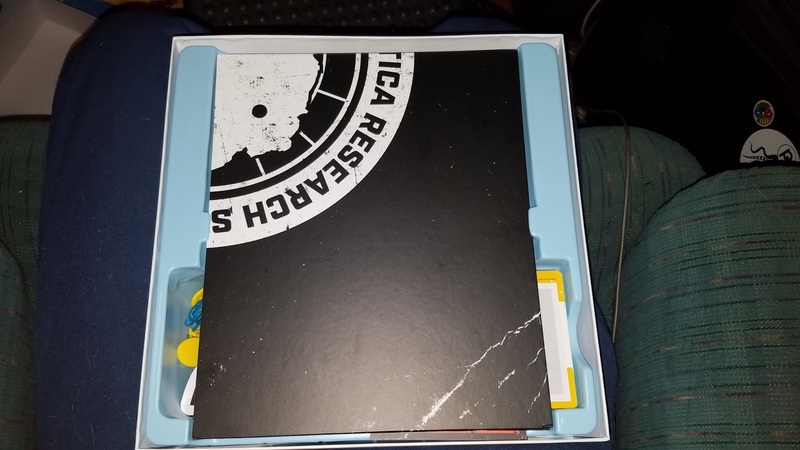 It even has a FAQ and Glossary in the back. Setup is minimal. You'll need to pull a few cards out based on the number of players as outlined in the book. The rest is all shuffling cards and tokens, putting them on the board, and choosing first player (Captain) and characters. Characters have one of three job types. Each job type has four characters with special Captain abilities. Two of those four will have exactly the same abilities. That's one of my biggest gripes about this game. They could have mixed up the primary and secondary abilities or at least shuffle them around so they would be available in different job types. Still, there are six sets of unique abilities, and it only plays eight. Not a big deal, especially given the requirement that the players distribute jobs evenly. It also cuts down on analysis paralysis and gets the game moving. The first player can choose any character with any job, but the next player has to choose from of the remaining job types, and so on. Missions have team requirements, such as number of players taken and job types. If a mission requires a job type, but the only character with that job is an alien, you can get around this once by tying them up with a rope (provided you have one) by discarding it. This negates the requirement. Rope can also be used to skip a Captain that you think is an alien. Either way, they are freed on the next turn, so use Rope judiciously. There are only a few. Licensing isn't the kiss of death it used to be. This is one of the small-but-growing pools of licensed games where a great theme inspired a solid design. It's a lighter, more social experience than the claustrophobic terror the film is known for, but it does an excellent job of capturing the paranoia of being stuck in a situation where you have to work with people to survive while some of them are trying to kill you. The mechanics work very well with the theme. There are a lot of subtle ways for the aliens to hamstring their team without making it obvious who is responsible. There are also ways for humans to make use of aliens. For instance, if a room has smoke, it will turn into fire on the next round. The round after that, the room is destroyed, and the token on it is out of the game. Four destroyed rooms means the aliens win, but if somebody finds out you had a fire extinguisher and didn't speak up, you're discovered. Putting out fires is a great way for an alien to look human, so they usually will. Item cards are found in rooms and must be located before the next sector can be explored. 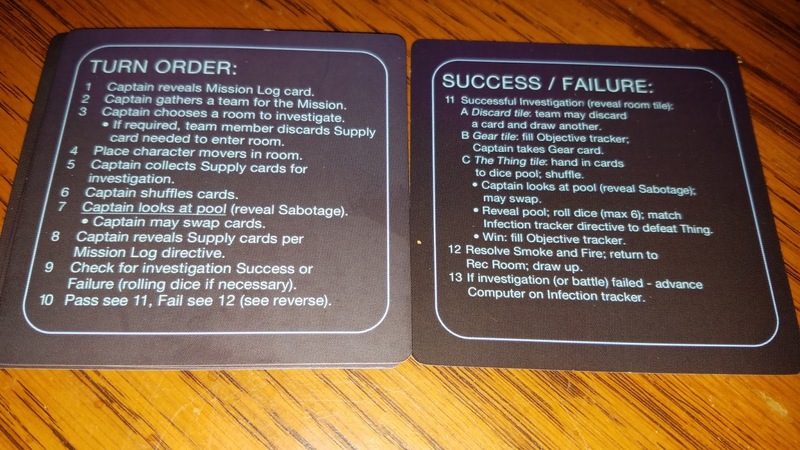 Once discovered, put the token on the objective track and the current Captain takes the appropriate card. They each have 1-2 uses. Player elimination is minimal. You can't kill anybody until you get the flamethrower in sector three. The Thing has a good power balance and leaves you a lot of wiggle room in how you play your character. 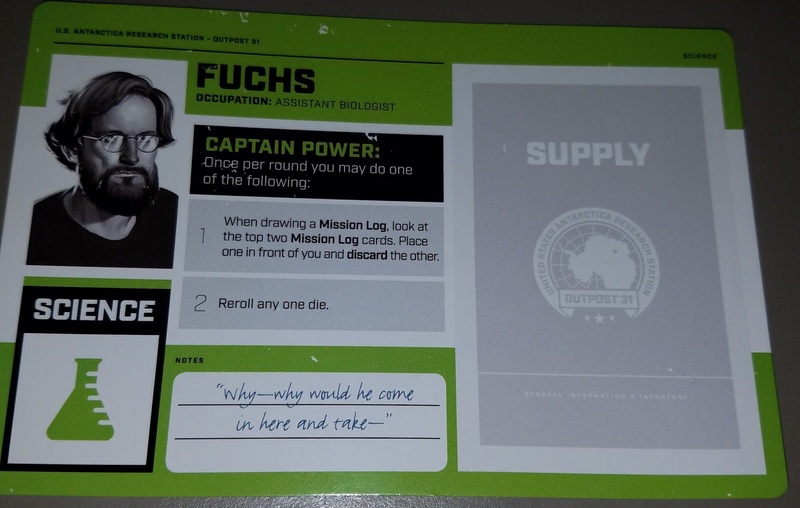 The top tells you how many people have to go on the mission. Beneath that, it shows what job types are required. In this case, you need at least one yellow (maintainance), one blue (ops), and one green (science). Next, we have some flavor text, and below that, the mission's goal. The Captain will go on the mission with a team of their choosing. It's best to talk about who has useful cards and who's probably an alien before you choose. 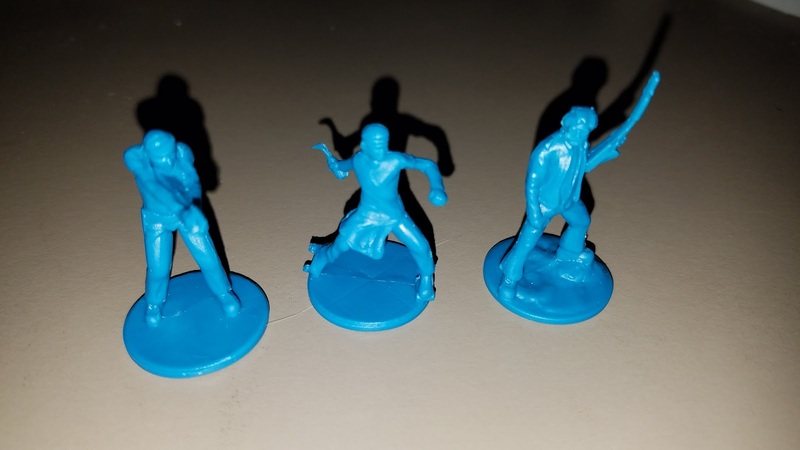 Once a team is chosen, those minis move to a room with an unflipped token, and everyone contributes a card from their hand to the mission pool. The Captain shuffles the card pool then looks at them. 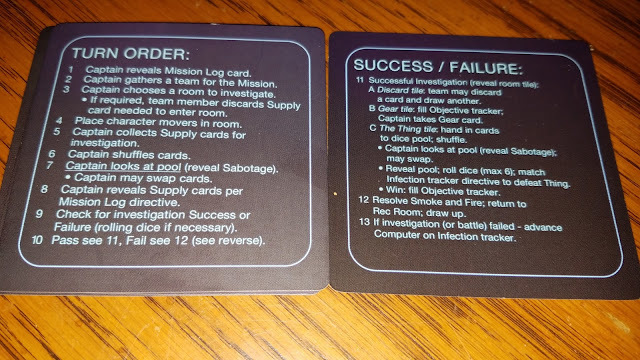 If there's a Sabotage card, resolve it. Otherwise, move on to the mission. 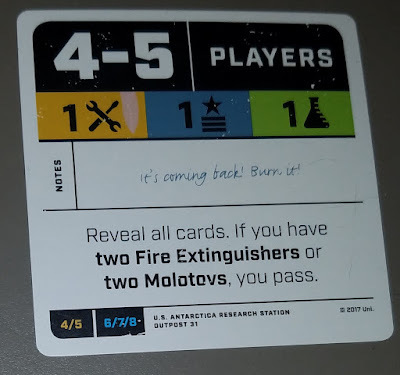 In the example above, you pass as long as you have either two Fire Extinguishers or two Molotovs within the cards revealed. Some missions require a dice roll. On those, everyone puts in cards that have a dice value and the Captain rolls that many dice trying to meet the target number, three of a kind, etc. You can only roll up to six dice, but you can reroll some of them multiple times. Dynamite and some Captain powers can be used to add rerolls or modify results. Other times, you shuffle the pool and try to draw a specific card. If it's the Thing, kill it with fire! Everyone on the mission contributes cards with dice values. Maybe you have what you need, maybe not. Maybe some people on your team are aliens and they say they're out of dice, anyway. Your goal corresponds to the track on the right of Infection Track. If you're fighting a Level 1 Thing, you have three rolls to get three of a kind. It's pretty easy with six dice, but some missions only have three people. There are a lot of times when you'll have no cards with dice values. If this happens when you have nothing in your hand but Sabotages, you still have to play something. Good luck convincing everyone that's the case. If you fail to kill the thing, shuffle its tile with the others from that Sector and redistribute them in the rooms. 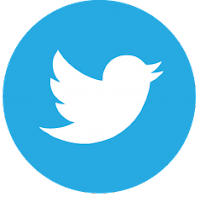 Move the Infection tracker and deal with the new disaster. Once you've found a Rope and killed a Thing, you will be able to explore Sector Two. Unfortunately, every time you enter a new Sector, you have to deal a new blood sample card to every player. Anybody who gets an Imitation card is now an alien. Everyone keeps one blood sample and returns the other to the pool on the board. Imitation cards must be kept unless you have two. Now you have up to three traitors, but you're making progress! If you fail to meet any of the mission requirements, everybody returns to the Rec Room. The Infection marker moves to the next space, and the bad thing on that space happens. The game-end conditions are as follows: the marker reaches the last space on the Infection Track, four rooms have been destroyed, or conditions are met and characters escape on the chopper. If only humans board the chopper, they win. If an alien boards or if any of the trackers reach the last space, the aliens win. 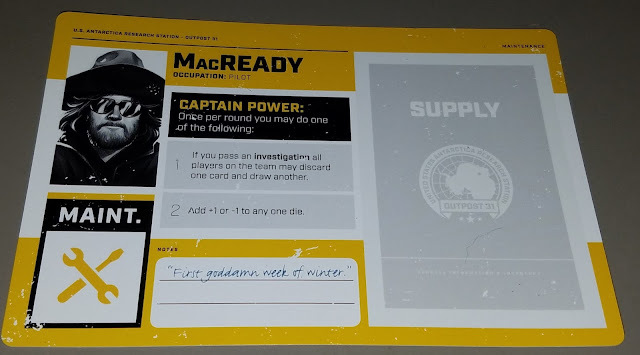 Game End - The Captain who filled the last spot on the objective track gets to nominate the final Captain. Everyone votes. If the nomination fails, the player to their left nominates someone. Every two failed nominations the infection tracker moves up. The same character can't be nominated twice. Once you have a successful nomination, the new Captain is in charge for the rest of the game. They decide who escapes and who is left behind. It's time for your "cleaverest" friend to say, "That Fuchs an alien!" If we're being honest, somebody probably said that on round one. After a lively debate, the Captain will decide how to use the free blood tests (if any) listed above the Infection track. More infection means fewer tests. Whoever you choose to test has to reveal their blood sample. There's no need to kill or tie anyone up. They simply get left behind. The fate of humanity depends on you. 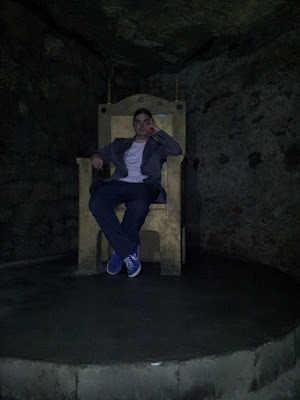 After another lively debate, the Captain chooses survivors. The back of the rule book has a chart detailing how many humans have to escape for a success. Survivors all flip their Blood Samples. If any Imitations are revealed, you lose and so does the humans race. If only Humans are on the chopper, they may never sleep again, but they win. The components are pretty good. The cards are a little thin. The art that's there is good, but it's relatively sparse. The minis look pretty good, but I've seen better. This could have benefited from a Kickstarter campaign. The best component is the insert. There's a custom spot for everything, and the board snaps in, holding everything tight. Plays a lot of people. Since the game hinges on the players more than the pieces, no two games will be the same. Great for parties, but gamers who hate party games can still enjoy it. This is a great gateway game, but fun for serious gamers, too. This really needs at least six players. You can play with 4-5, but it's really tight. 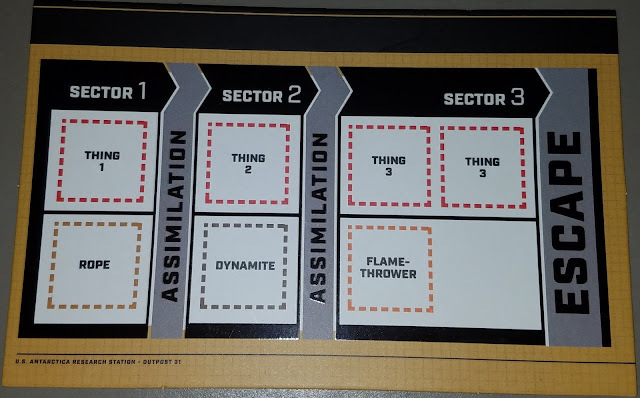 With four players, there's a good chance there will be two aliens as soon as you hit Sector 2. Captain abilities could be distributed better. The Thing is a great game. If you can get enough players to get it to the table, I highly recommend it. Werewolf. 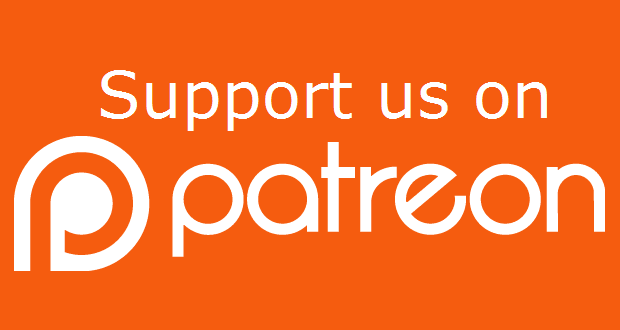 Social deduction, roleplaying, bluffing, hidden traitor, and hand management mechanics. 8 out of 10 super meeples! 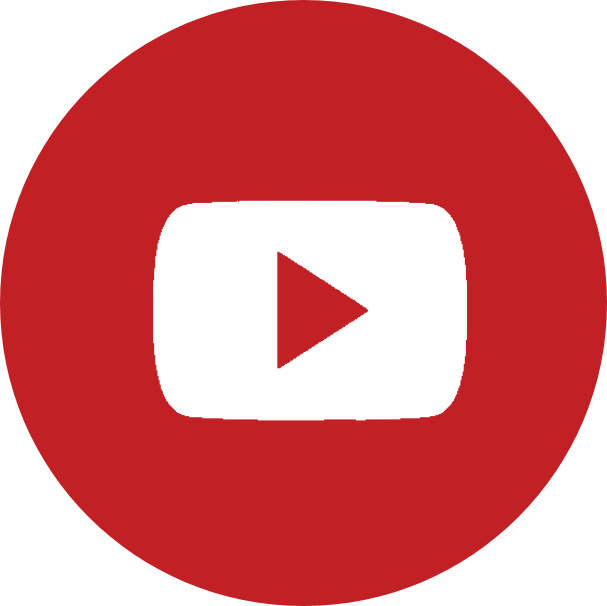 See all of Stephen's reviews HERE.